This design was drawn up in 1941, ahead of the 1942 destroyer programme, and was designed primarilly with AA defence in mind, ( it was at last recognised that this form of attack needed a lot of defence against ) and as such they had unrivalled AA power in the RN's destroyer fleet. Until then, not only had the lack of a suitably stable destroyer hull, high and low elevation gun and fire control system prevented a class like this; so had the need for "utility" destroyers to fill up the holes in the fleet as fast, cheaply and economically as possible. Originally, a 4.7" gun of 85 degrees elevation, fully automatic training / elevation and a fully stabilised hull was considered, along with a heavy and uniform secondary battery of twin, stabilised and RDF controlled Bofors 40mm AA ( the 2pdr. pom-pom was at last recognised as a wholly inadequate medium range weapon, being little more than a grossly oversized Maxim machine-gun. ) However, the decision to adopt a 4.5" gun as standard througout the destroyer fleet, to replace both the 4" and 4.7" calibres led to the adoption of Mk.IV twin turrets for the 4.5" gun being adopted. RDF comprised of AR types 275 and 282 for fire control, SW type 272 on the lattice foremast, and AW type 291 on the mainmast aft. With the larger hull more akin to the Tribal than the "utility" types, but 3.25' more beam, and little more displacement, than the previous, they were very stable, and due to this and their unpopularity, only Camperdown and Finisterre had fin stabilisers. Completion was delayed by the lack of Mk.VI DCT, and so modifications to the design were added; with all the forward 20mm guns being replaced by single 40mm Bofors, and in all but Armada, Barfluer, Camperdown and Hogue, the 4" gun was replaced by sded single Bofors, and the "Hazemeyer" ( RDF type 282 ) twin Bofors were replaced by "STAAG" ( RDF type 262 ) twin Bofors. Saintes, for a short while, carried the prototype Mk.VI turret of the "D" and later destroyer classes in "B" position. 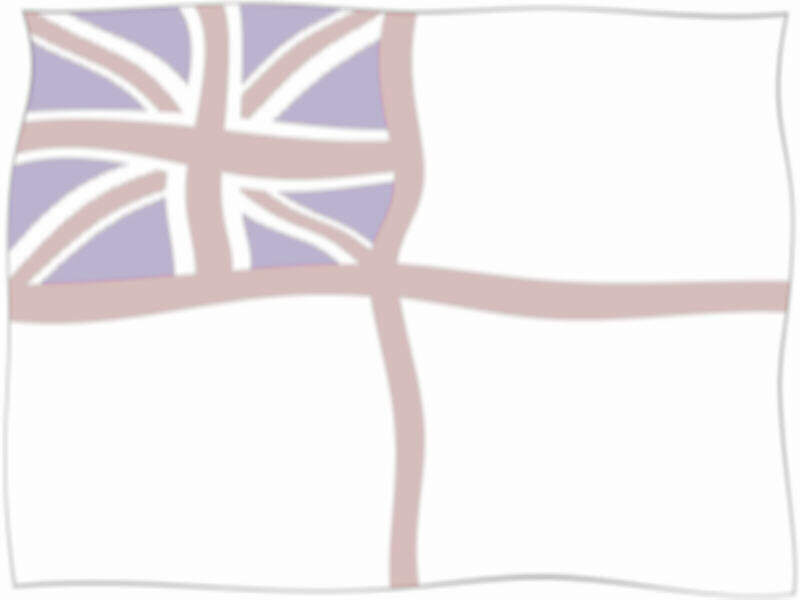 They were undoubtedly THE best destroyers produced wartime, and probably THE best traditional 'gun and torpedo' destroyer ever built by the RN; their large, spacious hulls seeming a luxury compared to the "S" class hulls that were pushed to the limits of stress in the "Z" and "Ca-" classes. They were also one of the most beautiful classes, even if their armament seemed to be a bit lop-sided in arrangement. Externally, the Battle group II's differed in that they had USN Mk.37 DCT, with the excellent GR type 275 RDF, a single 4.5" gun replaced the 4" amidships, for a homogenous battery, and simplifying control and supply arrangements, and a modified light AA armament. However, a lot of planning went into the design, although most of it never came around, mainly due to how to fit the huge, automatic, Mk.VI turret into the Battle's hull. However, due to the end of the war, the vessels that had been planned to carry the Mk.VI turret ( with an enlarged beam ) were not completed, and the class retained it's similarity to the predecessors. A squid mortar was also worked in aft, the Group 1's single DC rack being rather pitiful in capacity. Also, the forward twin 20mm AA, to be replaced by single 40mm's were not fitted, and the vessels shipped only the wing Bofors instead. The two STAAG mountings amidships were removed, and a single twin with am RDF type 282 fitted director tower was fitted, on the centreline. The inly other RDF changes was the different set on the DCT. 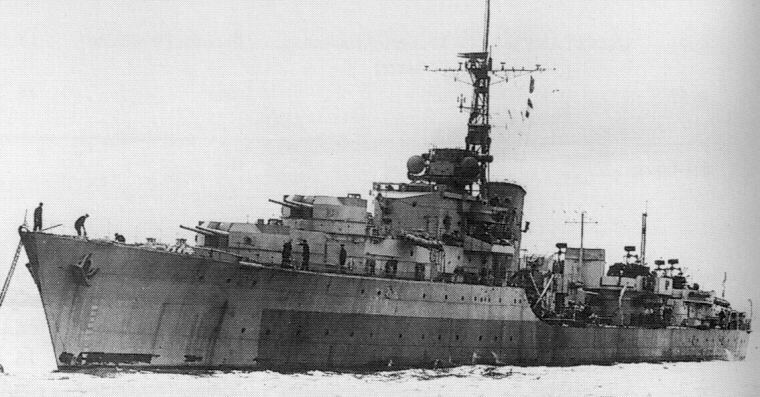 HMS Camperdown, with the "Hazemeyer" Bofors visible aft, and the low Mk.VI DCT crowning the bridge. Hogue at anchor. This shows the Mk.IV 4.5" guns well, and the RDF aerials on the "Hazemeyer" Bofors aft. Saintes running trials; she has the single but not the twin 40mm's added, and does not carry a 4" AA gun aft of the funnel. HMS Solebay, 40mm Barrels elevated. Note high freeboard of this hull forward - lovely dry ships compared to a "Z" class. Speed 35.75 kts, 31.25 kts full Range 4400 nm @ 20 kts.